Adventure seekers will soon have many new trails to explore. Source: Photoshot / Vostock Photo. 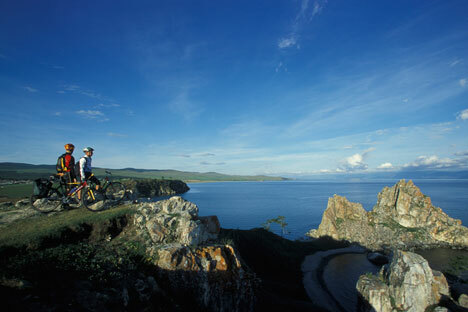 A new network of environmental trails will make Lake Baikal and its environs more accessible by foot, bike or horseback. Imagine a holiday in a land of freshwater seals and Stone Age villages, muskrats, sables and wild honeysuckle. The mosquitoes might make you stop short of calling it paradise, but Lake Baikal is becoming an increasingly popular destination for tourists seeking beauty, outdoor activities and wildlife. Among the many activities available are fishing, sailing, cycling and horseback riding as well as caving, mountain climbing and abseiling. And, to make the area more accessible to tourists, a new network of trails is being developed that will allow visitors to hike along the shores of Baikal and fully enjoy its natural beauty. The non-profit organisation Great Baikal Trail (GBT) is using international volunteer groups in two-week summer camps to help build them. So far, there are about 370 miles of trails and more are planned, including some specialised routes that are wheelchair accessible, or suitable for biking, horse-riding and cross-country skiing. Click to enlarge the map. Drawing by Alena Repkina. Work carried out by the volunteers over the summer included restoring a water mill, planting cherry trees along the Angara River, installing picnic tables and training further volunteers. Many of these projects are co-operative ventures, with Irkutsk Botanic Garden supplying the saplings and local enthusiasts working on a lakeside table. Last year, the US Forest Service donated money to the Baikal project which was used to provide signage and information panels about the National Park and the caverns in the Malaya Kadil’naya Valley. Volunteers from Britain, Germany, Austria, France and Russia have been teaching children in the Baikal region about climate change. The scheme also aims to help local people to see that it is in their interest to help protect Baikal’s clean water and to support those who want to offer accommodation by developing the infrastructure the area needs to attract tourists. The landscapes around Baikal range from mountains, taiga and permafrost to dense forests full of fruits and fungi. Birches, cedars, pines, larches and blue Siberian spruce trees grow on its shores, as well as wild vines and orchids. Elk, deer, bears, lynxes, blue hares and chipmunks are among the fauna, and the birds include white-tailed eagles. These attractions, together with hot mineral springs, wooden churches, islands and prehistoric monuments, make the area rich in resources that could draw a larger number of visitors. Developing the infrastructure to make these treasures accessible is an impressive goal and a continuing challenge.